The rheological behaviour of dissolved polymers is very complex. Both experiment and theory in this field have undergone rapid development in recent years. Therefore, we describe the possibilities of predicting the viscoelastic properties as well as the shear stability using the entanglement and reptation concepts and exemplifying mainly with narrow distributed polystyrene samples. The viscoelastic properties are discussed in relation to molar mass, concentration, solvent quality, chemical structure and shear rate. The structure-property relationships derived here permit the prediction of both the zero-shear viscosity, η0, as well as the shear rate dependent viscosity η(\( \dot \gamma \)). These relationships can be extended to non-Newtonian fluids. For solutions of coiled polymers in a thermodynamically good solvent, five distinct states of solution are formed: ideally dilute solution, semi-dilute particle solution, semi-dilute network solution, concentrated particle solution and concentrated network solution. For non-homogeneous, semi-dilute (moderately concentrated) solutions the slope in the linear region of the flow curve [η=f(\( \dot \gamma \))] must be standardised against the overlap parameter c· [η ]. 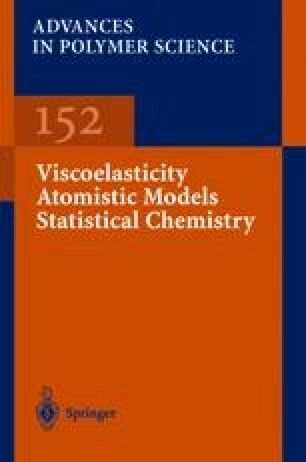 Furthermore, it is possible to predict the onset of shear degradation of polymeric liquids subjected to a laminar velocity field on the basis of molecular modeling. Also described is the phenomenon that the elastic nature (first normal stress difference) may overwhelm the viscous nature (shear stress) at relatively low shear rates. This high elasticity can cause deviation from laminar flow conditions and the onset conditions can be detected by plotting Sr=f(τ12).